overall, humans have been poor stewards of the earth and of all the the beings that inhabit our beautiful blue planet. when it comes to fishing the waters of the earth, instead of exerting control we are exult greed and exploit many species of fish at the expense of the future of the world's fishes. according to experts, many species of fish are near the point of extinction because of overfishing. humans don't have to be fishing failures and it does not have to be the end of the line for the world's fishes. if you eat fish, always ask before you buy and eat only sustainable seafood. the monterey bay aquarium provides a fantastic series of regional pocket guides for north america that list which fish are the best choices to consume, what are 'good alternatives' and what fish to avoid. click here if you would like to access and print off these guides. for those who live in the u.k., the marine conservation society provides a similar resource that you can find here. shapes of things released by the yardbirds in 1966 - the original yardbirds played in the 1960's the group is probably best known for turning out three guitarists who are considered the crème de la crème - eric clapton, jeff beck, and jimmie page. Thanks so much for this, for the cool images, the Yardbirds song (forgot ALL about them!) and for the link to the list of good and bad fishes. How are you? I've been thinking about you a lot. Sending you love. I've been reading a lot about the sustainability and health benefits of sardines. For years I turned my nose up at the very mention of them (maybe from them being the only source of protein on a trip to West Africa many years ago), but I have come to appreciate them. According to what I've read, the smaller the fish the more sustainable. 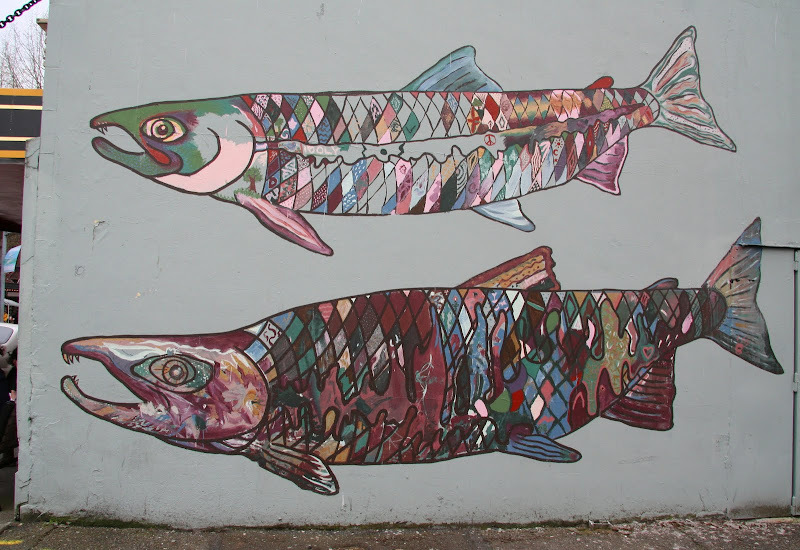 I definitely like these Salmon murals. Great stuff! And thanks for the Yardbirds video. The Yardbirds! I don't remember this song but know of the group because, as you say, it had in its ranks three great guitarists. 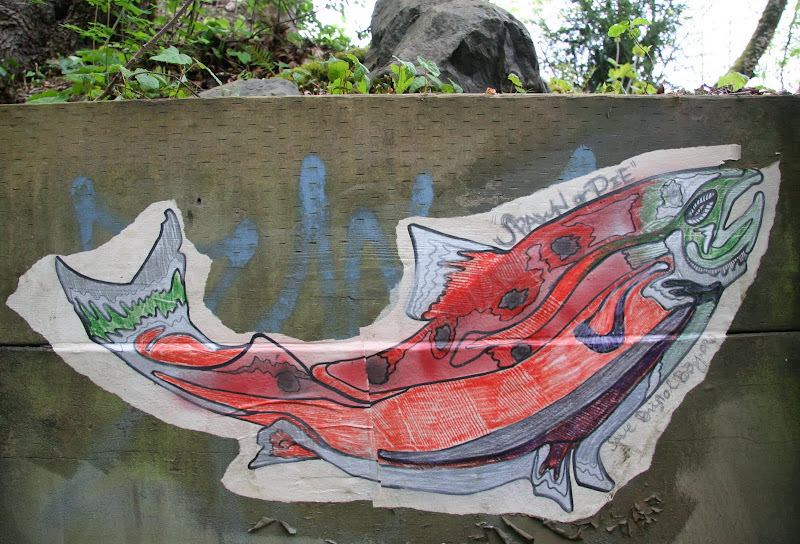 There was a record number of salmon this year, but some think the abundance was due to hatchery fish, which weaken the species. Thanks for this post. I didn't know most of the stuff you have put here actually. junk - i love sardines. it's good to eat low on the food chain - especially when it comes to fish. toxins get very concentrated the higher up and bigger the fish! daisy thanks for the link!!! daisy - the guide i have is very specific in terms of its recommendations of farmed fish - as far as salmon is concerned farmed salmon is on the AVOID list along with tilapia that is farmed in asia. i printed off the guide for the central us since that's where i live, the salmon on the best for this guide is ONLY wild. Thanks for clarifying kimy. I must have mis-read it. Will have to go look again. Raining like Niagara here! But having a good time. It's Thanksgiving weekend in Canada.